Florence bike tour departs at 10am. We are comparing Florence Bike Tour Prices from leading ticket suppliers and Try to find you Cheap tickets prices on the market. Take a leisurely bike tour through the centre of Florence, away from the busy roads and into traffic-free walkways and famous squares. This is ideal for both adults and children, individuals or small groups. Exploring by bike gives you the freedom to escape from overcrowded piazzas and travel to the outer edges of Central Florence. You'll also cover much more of the city then you would on a walking tour. Start by meeting your friendly guide on La Piazza della Repubblica, after brief introductions it will be time to start peddling. During the 2.5-hour tour you will visit major landmarks of the city including Santa Maria Novella, Duomo, Ponte Vecchio, Uffizi Gallery, Palazzo Pitti and Piazza della Signoria. Hear the history of this 2,000-year old city, fun facts and anecdotes, as well as scandals of the wealthiest families of Florence. This is a relaxed sightseeing experience so take a break and enjoy a complimentary gelato or hot chocolate in Oltrarno district. Pause to ask you guide for tips and recommendations and take your time to photograph this marvellous city. There's no need to be an Olympic cyclist, just the ability to ride a bike through the city is enough. Ideal for first-time visitors, you'll get a whistle-stop tour of the entire city. 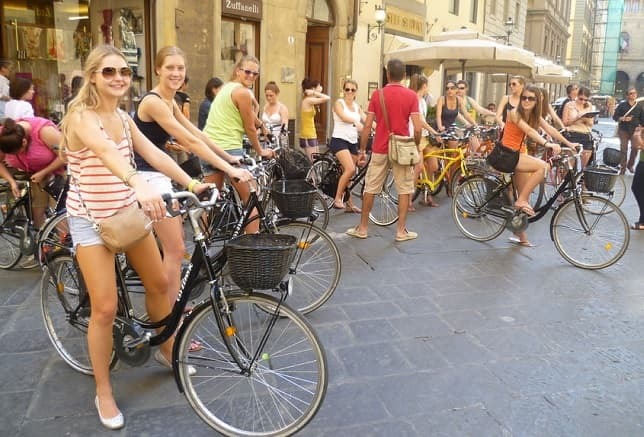 Your Experience With Florence Bike Tour? Get active and explore the Centre of Florence by vintage style bicycle. Wizz through the city centre and tour the banks of the river on your very own bicycle. Benefit from the tips and knowledge of a local tour guide. Skip the city centre traffic and pass by Florence top attractions and landmarks. See the city like a local. Learn about the famous squares as well as the hides gems of the this iconic Italian city. What Florence Bike Tour Includes? Rental of vintage bicycle and helmet. Wear comfortable clothes and bring a bottle of water during the hot summer months. During the peak season book the earliest tour to avoid huge crowds and uncomfortable heat. You may also enjoy the Florence Vespa Tour. Travelers Reviews about Florence Bike Tour? This tour has 4.7 out of 5-stars on Get Your guide. On TripAdvisor and Viator customers have given the Florence Bike Tour 4.5-star feedback. Comments suggest that the tour guides are very knowledgeable and helpful throughout the tour. Travellers have said that they had a fantastic time on the tour would thoroughly recommend it. Electronic or printed tickets are accepted. Tickets are refundable but cancellation fees may apply is cancelled less than 7 days in advance. Please wear comfortable clothing and dress appropriately for the weather, this is will only be cancelled in the event of severe weather. Meeting Point: Piazzale della Repubblica, Central Florence.